by Avatar Adi Da Samraj Author · Bill Gottlieb Author of introduction, etc. 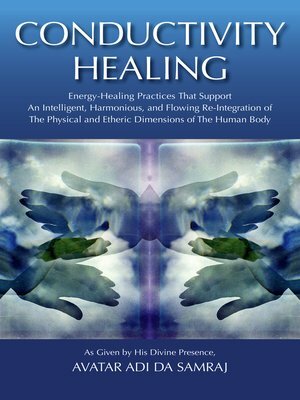 In this remarkable book, the fully awakened Spiritual Realizer Avatar Adi Da Samraj offers unique wisdom and practical guidance for understanding and engaging in energy healing. The book presents a series of simple practices that guide you in feeling, breathing, and circulating the "etheric" energy that surrounds and pervades the body-mind, thereby enhancing well-being in yourself and others. The many practices presented in this book include: a form of the laying on of hands, yogic "conductivity" massage, right breathing, yogic bodily "locks", polarity screens, pranayama, the hamsadanda (meditation stick), twirling, water immersion, and tensing-and-relaxing. But although specific practices are recommended and described, Conductivity Healing does not offer a so-called cure for any presumed illness. Nor is it a guide to self-improvement or human evolution. Rather, it is an in-depth consideration of the energy structure of the human being, including our fundamental Condition of Conscious Light. Therefore, the healing processes described in this book not only relate to physical and emotional well-being but also account for the process of going beyond the illusion of separateness, to free participation in Conscious Light. In summary, Avatar Adi Da offers guidance and help in discovering and taking responsibility for the energy dimensions of your body-mind—and thereby freely participating in the Indivisible Unity of Reality.